. . . rock roses are a pleasure to plant and their possibilities are endless. They are best clothing hot, dry banks, or tumbling over rocks in a chaparral-type planting, or billowing out from an island planting of drought resistant shrubs . . .
“Pseudo-mediterranean” is the designation often given to the climate of the Pacific Northwest, west of the Cascades. We might not have the heat or lengthy summer drought of much of California, but the reliably dry summers place as much stress on landscape plants as cold and rain do in winter. Restricted water supplies in some communities have increased the cost of irrigation for gardeners and stimulated a discussion about landscapes that require less water. This has created a natural interest in the use of more native plants as well as plants from other regions that will thrive in our climate with minimal irrigation. 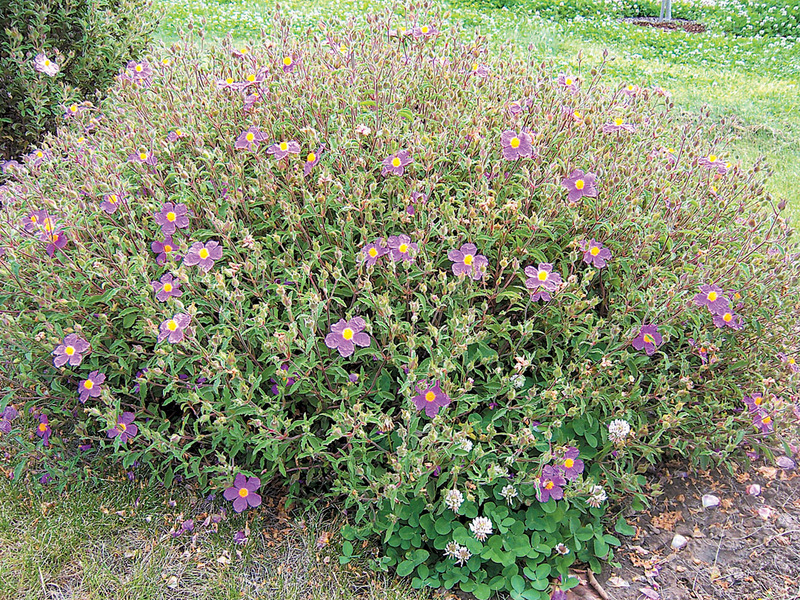 Most Northwest gardeners are familiar with rockrose (Cistus spp. ), one of the plants well-suited for use in the drier garden. Evergreen shrubs of Mediterranean origin, the roughly twenty species range from the Canary Islands through the Mediterranean Basin to the Caucasus Mountains. The name of the genus is derived from the Greek word kisthos or kistos, both classical names for various species. 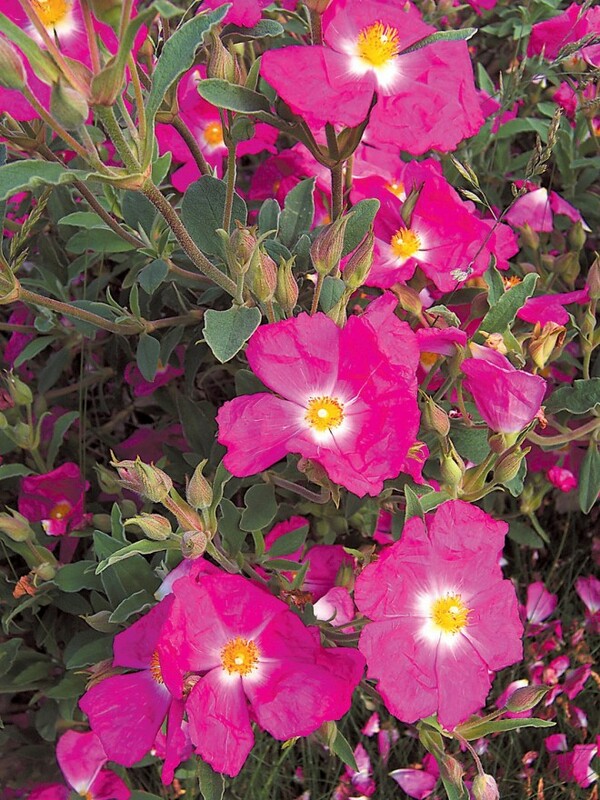 The name rockrose acknowledges the resemblance of the flowers to old-fashioned, single roses and the preferred habitat of the plants—rocky, relatively poor soil. 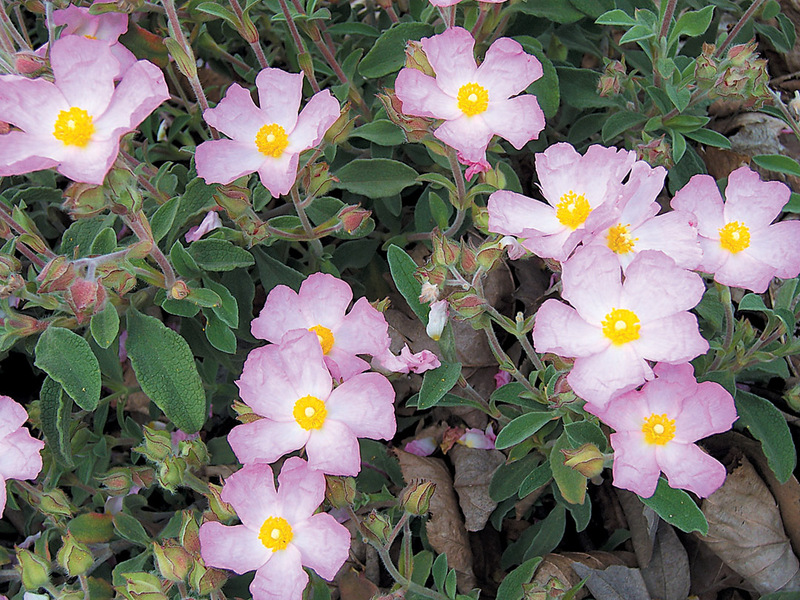 Cistus make up a diverse group ranging from dwarf plants only a foot tall, to some that exceed seven feet in height. The habit varies from flat and spreading, to mounding, and, in a few cases, upright. All have opposite leaves, which may be mid- to dark green but are frequently grayish. Like other Mediterranean herbs, such as rosemary or lavender, the foliage is often aromatic, a characteristic that is particularly noticeable on warm days and makes the plants appealing even when not in flower. The leaves of some species, such as C. ladanifer, produce an aromatic substance called ladanum in abundance; it gives a shiny appearance to the entire plant and makes the leaves and stems noticeably sticky. The flowers are simple, yet distinctive, with delicate, often crinkled petals that open in the morning and usually drop after only a few hours. The following morning, a new group of flowers will open; in most rockroses, the floral show will continue this way for two to three weeks. Some selections, notably ‘Sunset’ and C. inflatus, will flower sporadically for much of the summer. In general, however, the flowering time for Cistus in the Northwest is April through early July. The unscented flowers are usually white, pink, or purplish. The flowers of some cultivars may also have a distinctive reddish or brown blotch at the base of each petal. The source of this blotch is C. ladanifer, which is the only species with blotched flowers and which has conveyed this trait to numerous hybrid selections. 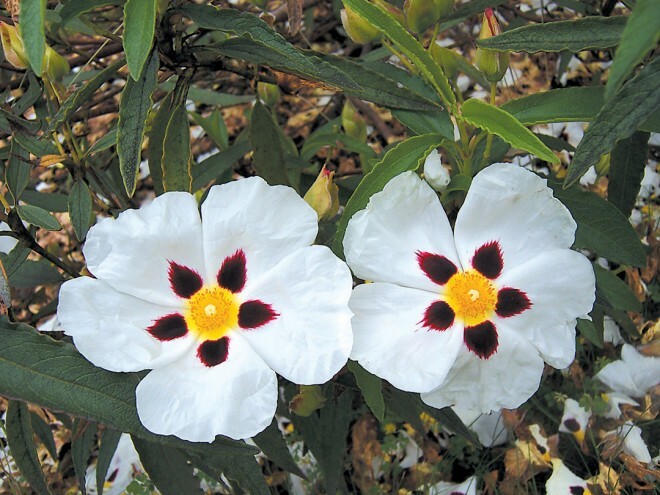 Cistus may be most conveniently divided into white- and pink-flowered species and hybrids. The white-flowered species include C. ladanifer, C. laurifolius, C. monspeliensis, C. populifolius, and C. salviifolius. Pink-flowered species include C. albidus, C. creticus, C. crispus, and C. heterophyllus. There are also several supposedly tender species found in the Canary Islands, specifically C. osbeckifolius, C. chinamadensis and C. ochreatus; despite their unsuitability for general cultivation, these species have been used to introduce dramatic foliar and floral color effects in some of the hybrids. Since rockroses interbreed readily in the wild and in cultivation, there are many hybrid species and cultivars available. It is these rockrose hybrids that are most commonly cultivated in the Northwest. There are about seventy hybrid species and cultivars described, although only a few of them are commonly grown in North America. The best known is Cistus &times;purpureus, a hybrid of C. creticus and C. ladanifer. It grows to a height of four feet and a spread of six feet, and has pink flowers with the distinctive dark brown blotch at the base of each petal. The other commonly grown hybrid, C. &times;hybridus (syn. C. &times;corbariensis), is derived from C. populifolius and C. salviifolius; it makes a rounded shrub four feet tall and six feet or more across, with unblotched white flowers. Also available is C. &times;skanbergii (C. monspeliensis &times; C. parviflorus), similar in size to C. &times;hybridus but with light pink flowers. Many more hybrids are grown less widely, among them C. &times;aguilarii (C. ladanifer &times; C. populifolius). There are also a number of cultivars of C. &times;argenteus (C. laurifolius &times; C. &times;canescens), such as ‘Silver Pink’, ‘Silver Ghost’, ‘Peggy Sammons’, ‘Paper Moon’, ‘Stripey’, and ‘Blushing Peggy Sammons’. Although Cistus are of Mediterranean origin and thought to be somewhat tender, experience over the last few years in the trial grounds at Oregon State University has shown that many, if not most, of the Cistus available in the Northwest are at least hardy in a “normal” winter. They are not all equal, however, when it comes to longevity. Plant and foliage quality decline precipitously after four to five years on some cultivars; others remain attractive over the same period. Some popular cultivars that are showy in flower, (‘Victor Reiter’, ‘Doris Hibberson’, and C. &times;rodiaei ‘Jessica’, for instance) become sparse and leggy, resulting in poor specimens in the landscape after only four years. This problem also plagues all of the popular C. &times;argenteus selections, including ‘Silver Pink’ and ‘Peggy Sammons’; the most acceptable of this group is ‘Blushing Peggy Sammons’, which has the advantage of some of the showiest flowers. On the other hand, some cultivars flower well and retain good form and foliage quality; these deserve greater use. Among the larger rockroses, several are naturals for use as specimens in the landscape, because of their upright habit. Cistus &times;aguilarii can easily reach seven feet tall after four to five years, and will reach about five feet wide; large, pure white blossoms, up to three inches across, appear throughout May. It is often sold incorrectly as ‘Blanche’, which is actually a cultivar of C. ladanifer and a decidedly different plant. A true cultivar of C. &times;aguilarii, however, is ‘Maculatus’, a desirable selection of similar size with blotched flowers. Cistus &times;ralettii is an interesting hybrid between C. creticus and C. symphytifolius. The former is found in the eastern Mediterranean, and the latter is endemic to the Canary Islands; despite its tender parentage, C. &times;ralettii has proven to be quite tough. It has large, softly hairy leaves, and grows quite upright to six feet tall, with a profusion of pink flowers from mid-May to mid-July. Many of the larger rockroses have a mounded habit (wider than they are tall) that makes them useful as tall groundcovers. 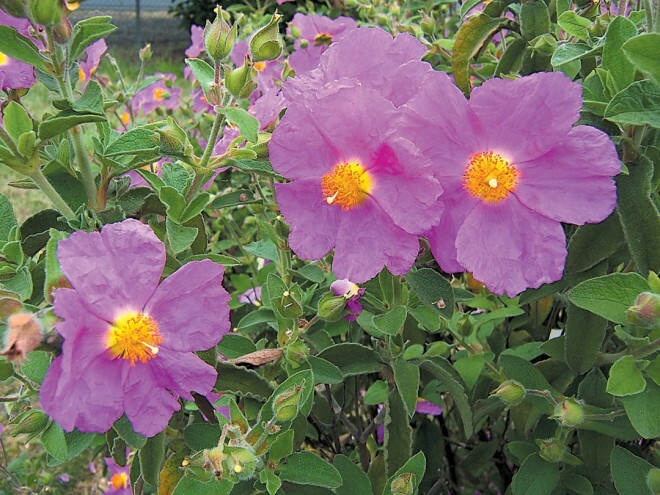 The two most commonly grown, Cistus &times;hybridus and C. &times;purpureus, fit this description and, in general, are decent landscape plants, although the foliage quality of C. &times;purpureus seems to decline after five to six years. ‘Snowfire’ is a large plant, reaching five feet tall and eight feet wide; its white flowers have a red blotch at the base of each petal and appear from mid-May through late June. A slightly smaller plant is ‘Ruby Cluster’, which grows to four feet by six feet and has blotched white flowers. Two other species bear mention as tall groundcovers of about the same size: C. inflatus (syn. C. hirsutus) and C. &times;laxus. Both feature pure white flowers and mature into nicely shaped mounds. 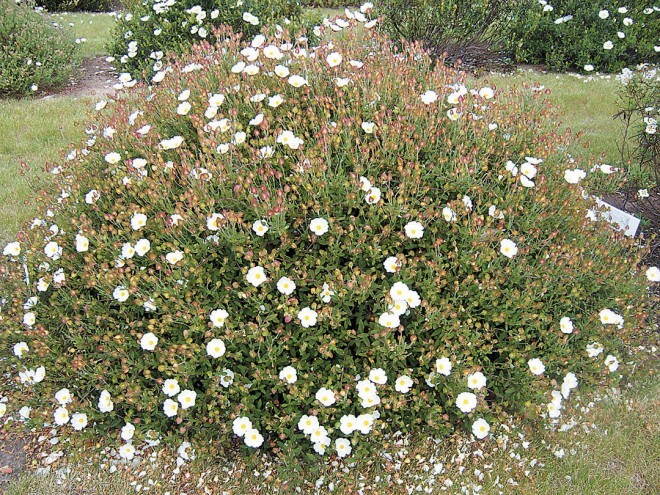 Somewhat smaller than the last group, but equally effective as a groundcover, is Cistus &times;obtusifolius. 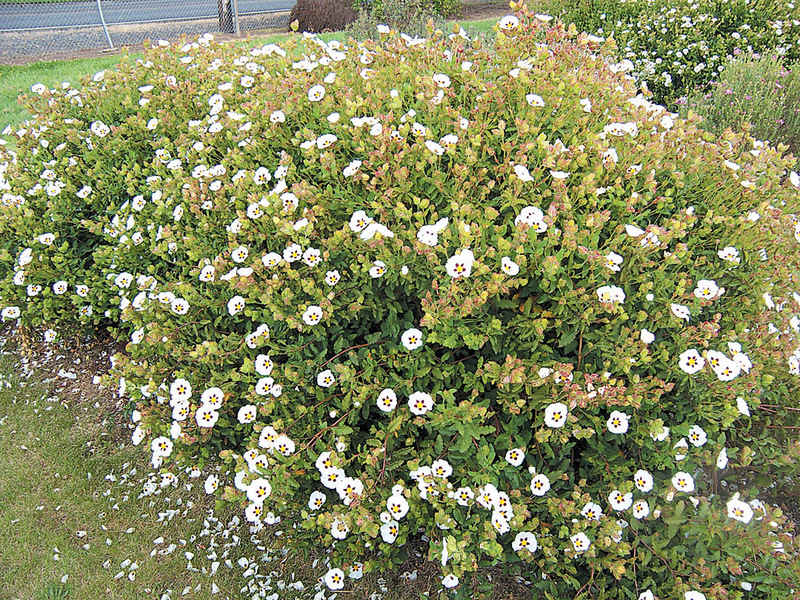 It makes a near-perfect dome of foliage, three feet tall and five feet wide, with pure white flowers. This would make an excellent substitute for C. &times;hybridus, which is widely used but is a larger plant; usually squeezed into small spaces, and irrigated, C. &times;hybridus often must be sheared heavily, from which it seldom recovers. Another good groundcover is ‘Tramontane’, a recently named selection of C. &times;florentinus. It makes a dense green shrub, two feet tall and five feet across, with white, unblotched flowers from late May into June. For the smaller garden, or even for large containers, there are options among the rockroses. The best known of these, Cistus &times;pulverulentus ‘Sunset’, forms a mound of gray green foliage, two feet tall and four feet wide. ‘Sunset’ begins producing its brilliant magenta flowers in late May and, along with C. inflatus, can still be found with a few blossoms as late as September. ‘Grayswood Pink’ is of a similar habit, although it seems to maintain a tighter form and does not open up the way ‘Sunset’ can with age. As the name suggests, ‘Grayswood Pink’ features pink flowers starting in early May. With an even lower, spreading form, C. creticus ‘Lasithi’ remains below eighteen inches in height, and spreads to three feet. Small, wavy edged leaves give it a fine texture to complement its pink flowers. In Pacific Northwest landscapes, rockroses are best planted in full sun, where they will receive no summer water. Most are suitable for Sunset zones 6-9 and 14-24 and many are already grown in zones 4-5; they are generally hardy to about 15°F. South- or west-facing walls and dry banks are perfect locations, assuming water drains freely from the soil year-round. Summer irrigation is unnecessary, as it typically produces a flush of unwanted growth and may predispose the plants to root or crown diseases. Shearing that excess growth is not advisable, since most rockroses resent hard pruning and quickly decline. They should be planted in the fall to ensure the plants will be well rooted and not require irrigation by the following summer. Natural companions for these plants are other mediterranean-climate plants, such as rosemary (Rosmarinus), lavender (Lavandula), Ceanothus, and manzanita (Arctostaphylos), although rockroses also combine well with informal, drought-tolerant Northwest natives, such as oceanspray (Holodiscus discolor) and flowering currant (Ribes spp.). As flowering specimens or groundcovers for the dry garden, Cistus have a lot to offer gardeners in the Pacific Northwest, as well as in other regions with some variation of a mediterranean climate. Some of the cultivars mentioned are becoming better known in the nursery trade, so gardeners will soon have a few more choices from this appealing genus.